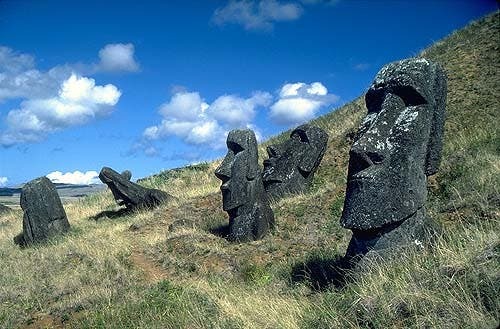 A team at the University of Southampton are pioneering a technique to predict when an ecosystem is likely to collapse, which may also have potential for foretelling crises in agriculture, fisheries or even social systems preventing another "Easter Island" collapse from occuring. The scientists applied a mathematical model to a real world situation, the environmental collapse of a lake in China, to help prove a theory which suggests an ecosystem 'flickers', or fluctuates dramatically between healthy and unhealthy states, shortly before its eventual collapse. "We wanted to prove that this 'flickering' occurs just ahead of a dramatic change in a system – be it a social, ecological or climatic one – and that this method could potentially be used to predict future critical changes in other impacted systems in the world around us," said John Dearing, head of geography at Southampton. Eminent Australian scientist Professor Frank Fenner, , emeritus professor of microbiology at the Australian National University (ANU), who helped to wipe out smallpox, predicts humans will probably be extinct within 100 years, because of overpopulation, environmental destruction and climate change. Tools, such as that being pioneered at Southampton, may prevent this dire prediction from becoming a reality. If past is prolgue, 70,000 years ago the human population was reduced to small isolated groups in Africa, apparently because of drought, according to a 2010 analysis by researchers at Stanford University. The estimated the number of early humans may have shrunk as low as 2,000 before numbers began to expand again in the early Stone Age. Tiny bands of early humans, forced apart by harsh environmental conditions, coming back from the brink to reunite and populate the world. Truly an epic drama, written in our DNA." Wells is director of the Genographic Project, launched in 2005 to study anthropology using genetics. The report was published in the American Journal of Human Genetics. Fenner says homo sapiens will not be able to survive the population explosion and “unbridled consumption,” and will become extinct, perhaps within a century, along with many other species. United Nations official figures from last year estimate the human population is seven billion, and is predicted to pass seven billion next year. Fenner said that climate change is only at its beginning, but is likely to be the cause of our extinction. The Southampton team led by Dr Rong Wang extracted core samples from sediment at the bottom of Lake Erhai in Yunnan province, China and charted the levels and variation of fossilised algae (diatoms) over a 125-year period. Analysis of the core sample data showed the algae communities remained relatively stable up until about 30 years before the lake's collapse into a turbid or polluted state. However, the core samples for these last three decades showed much fluctuation, indicating there had been numerous dramatic changes in the types and concentrations of algae present in the water – evidence of the 'flickering' before the lake's final definitive change of state. "By using the algae as a measure of the lake's health, we have shown that its eco-system 'wobbled' before making a critical transition – in this instance, to a turbid state. Dramatic swings can be seen in other data, suggesting large external impacts on the lake over a long time period – for example, pollution from fertilisers, sewage from fields and changes in water levels – caused the system to switch back and forth rapidly between alternate states." said Rong Wang. "Eventually, the lake's ecosystem could no longer cope or recover – losing resilience and reaching what is called a 'tipping point' and collapsing altogether." "In this case, we used algae as a marker of how the lake's ecosystem was holding-up against external impacts – but who's to say we couldn't use this method in other ways? For example, perhaps we should look for 'flickering' signals in climate data to try and foretell impending crises?" concluded co-author Dr Pete Langdon. More information: lickering gives early warning signals of a critical transition to a eutrophic lake state, Nature, 18 November 2012. Journal reference: Nature.